Poodleism: Get your booties on...It's COOOOLD out there! Happy Groundhogs day Poodleizers! 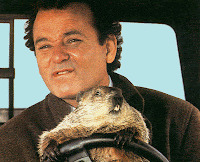 This chilly morning little Punxsutawney Phil saw his shadow, meaning we will endure 6 more weeks of winter. I'm sort of glad for it. I only got my favorite wintertime clothes through one or two solid rotations this wintertime. I also live in realatively temperate Dallas, TX. I'm sure some of you NYC-ers aren't thrilled. The good news for you is that this prediction is not based on any meteorology or science whatsoever! Which brings me to my next point, I love little traditions like this. Punxsutawney Phil is one of my favorite figures of lore. I love when I can't understand traditions. I like that in some corners of the world people still do ridiculous things like stand around all night in freezing Pennsylvania waiting for a rodent to see or not see his shadow which may or may not exist. They've been doing it for over 120 years! I bet poor little Phil is cold and overwhelmed. I wonder if they sedate him. I read from an extremely reliable source that the rest of the year Phil lives with his wife, Phyllis in the town library. How sweet. Happy Another 6 Weeks of Winter Everyone!